A very short note: Paul Anderson of Post Mortem Press has announced that T ORN REALITIES and two other titles are available for a limited time in a deluxe hardcover edition format. My dog in this manger, TORN REALITIES reprints my story “The Calm” — as well, one might add, as Clive Barker’s novella “Rawhead Rex.” Orders must be placed by May 31 and, if at least ten copies of a given title have not been ordered, a full refund will be made. Copies are numbered and will come with dust jackets and are available with free shipping in the US and Canada. If interested, more information can be found here. ‘Tis the season. Today brings the announcement of another year-end sale, of a number of titles by Post Mortem Press, with some books priced as low as $5.00. Those with my work in them don’t come down quite that inexpensively, but even they offer a 25 percent discount. Moreover, shipping is a flat rate of $3.50 for domestic (US) orders, regardless of how many books you order. And, yes, I do have two dogs in this fight, “Girls Gone Dead” in NEW DAWN FADES (cf. November 8, September 18 2011, et al.) and “The Calm” in TORN REALITIES (January 21 2012), the latter also featuring a reprint of Clive Barker’s novella “Rawhead Rex,” with sale prices of $12.00 and $13.50 respectively. Orders before December 10 are suggested for worry-free delivery before Christmas. Those interested in ordering — or simply curious to see what’s offered — need only press here. Weeks, it seems, of mid-90s weather continue, though not the low 100s like it was not so long ago. So what’s hot? one might ask. The answer for today is a new review of TORN REALITIES (cf. April 21, et al.) on bloody-disgusting.com, as passed on by anthology editor Paul Anderson via Facebook. 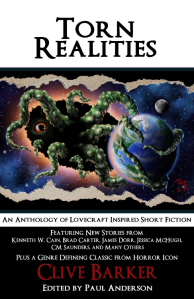 “Of the 19 stories, there are some real gems to behold, with very few that do not fit the bill.” And yes, to be sure, “The Calm,” my own pig in this post-Lovecraftian poke, gets a nice mention too. Other tales singled out for mention include lead story “Opt-In” by J. W. Schnarr, Clive Barker’s “Rawhead Rex” (of course), “Delta Pi” by Matt Moore (“. . . using mathematics as a vessel for terror”), “hard sci-fi” stories “Visions of Parin” by Joseph Williams and Jamie Lackey’s “What Waits Out There,” and the closer, “The Seventh Plague” by Allie Marini Batts. Also noted are Kathryn Board’s “The Troll that Jack Built” and “A Ride in the Dream Machine” by Jessica McHugh. In total, reviewer/poster “Lonmonster” gives TORN REALITIES 4 Skulls out of a possible 5. The review itself can be obtained by clicking here.